I had a great year in 2011. Well, on the bike at least... financially it was another story. I was lucky enough to stay healthy and even luckier that my wonderful wife tolerates my crazy cycling adventures! My total bike mileage for the year was 11,071mi. That's a lot of time apart, so without her support and understanding I wouldn't be able to do this. Thank you Jo! 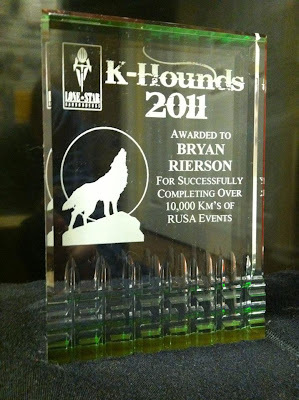 I had three goals at the start of 2011: K-Hound status (10,000km of RUSA credit,) to complete my first 1200K, and generally to have more fun on the bike by worrying less about speed and time. Turns out that riding enough permanents and brevets to get to 10,000k is great training for a 1200K... I completed the 1200K in August at Tony G's Taste of Carolina 1200 and finished the year with 10,222km of RUSA credit. 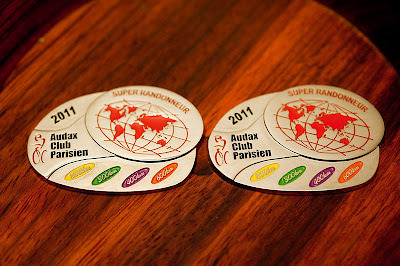 In the process I also completed 2 full ACP Super Randonneur series. Not bad for my 2nd year as a Randonneur! None of these rides were super fast, the only rides I ever finished first were solo permanents, and I enjoyed each and every one of them. 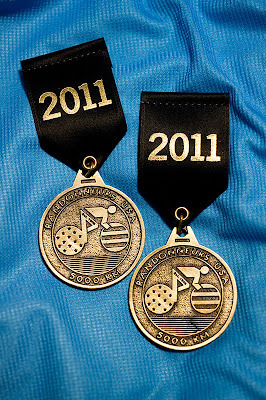 On New Year's Day I rode a 200K brevet to complete my R-12 for the second year in a row, so I've started 2012 off right! I rode in my 3rd Bike MS New Bern event just 4 days after completing the TC1200- it was the best Bike MS ride I've had yet! I didn't bother trying to ride fast or ride the century both days, instead I rode with my wife and a few others from our team, the Selma Cyclepaths. We did the 75 mile routes both days at a reasonable pace and stopped at most of the rest stops to enjoy the amenities. Imagine my surprise to find that the rest stops are stocked with homemade baked goods, Girl Scout cookies, and friendly volunteers. There's even a full lunch at one rest stop, and a couple of stops had live bands! The fast guys blow past all this stuff. 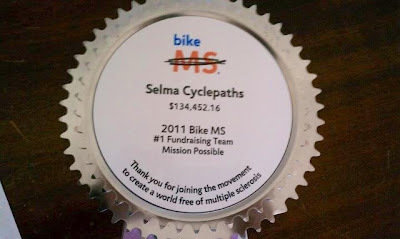 The Selma Cyclepaths had a great year also- we won Top Fundraising Team for the 7th year in a row, raising over $134,000 for the National MS Society's Eastern NC chapter! Our goal for the year had been to raise $150,000- enough to make us the first team to reach an all-time total of 1 million dollars. 2011's fundraising total was still a record year for us, and we'll settle for reaching the million-dollar team status in 2012! I've been thinking a lot recently about what goals I'll set for 2012. 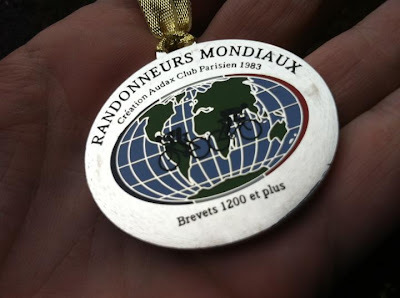 I'm thinking about RUSA's American Randonneur Challenge- 2 domestic 1200K's. 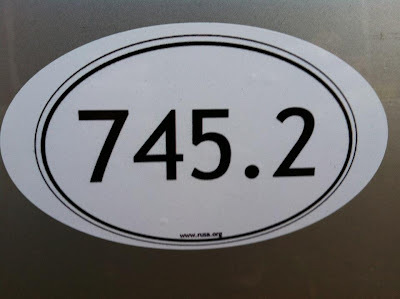 For me that will mean attempting the Shenandoah 1200 and then the Taste of Carolina 1200 again. No total mileage or RUSA kilometer goals, I think those will come naturally in training for the 1200's. I'm also toying with the idea of riding every RUSA permanent in NC, if I can do that I'll have 5,500km in the bag! The big goal is once again just to have fun on the bike. If I remember the lessons of this year's Bike MS ride I think I can do it, and 2012 will be another great year! All the perms in NC, eh? Seems to me that Maria tried that ... people kept adding perms faster than she could cross them off the list. Seems a worthy quest, though. Good luck and good riding. One small thing: I thought you finished a particular February Black Creek perm ahead of me ... maybe only a second or two ... but ... . Enjoyed that ride very much. Also the October Kerr Lake Loop with you and MaryF. As Deaner might write: "let's do it again." Looks like 3 NC perms )or perm-pops) have been added since Jan-01. that would make 6 new perms / perm-pops since Nov-01. Routes are being added at a pretty fast rate.